Chelsea Estates is at 2435 Lobb Avenue just off Shaughnessy Street in Port Coquitlam. It was built in 1991 with funding from CMHC and the Provincial Government, and was was managed by the Port Coquitlam Housing Society until it was inherited by New Chelsea Society in 2012. Chelsea Estates is located close to many parks, sport fields, trails and recreation facilities, as well as all levels of schools. Major shopping centres are located within 5km, and major transportation routes are very accessible. 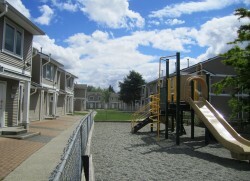 56 family townhouses; private, self-contained 2-storey units. Laundry rooms; laundry plumbing hookups also available inside townhouse units.